Ever lock eyes with someone and later on regret not have gone up to introduced yourself? Don't worry -- Happn is here to help. The new French dating app keeps a log of everyone you cross paths with throughout the day so you can check through the log and get in touch. It only works if both people have the app. The potential couple can't talk to each other unless both people indicate they're interested. A user can try and send a "charm" to get someone's attention -- free for women to send and small fee for men to pay. Craigslist's "Missed Connections" section has long served as the website where people had to go to find that person you wish you would have said hello. But Happn takes the hunting and pecking out of the process. Happn has already taken off in France, and the company says it's seeing major growth in other European cities like London and Berlin. It has more than 350,000 members and 100,000 daily active users. Related: Doggie dates have come to Tinder! As with any app that uses geolocation, privacy is a concern. The CEO of the app, Didier Rappaport, says that the app only shares the approximate location of where you crossed paths with someone and their profile. "We don't track people, we just register the crossing points, which means we don't know what other travels you're doing," Rappaport said, who is the former Dailymotion COO. He also noted that users can only register for the app using their Facebook (FB) accounts to avoid people signing up for fake accounts. Dating app Tinder similarly uses geolocation to display the singles closest to you. 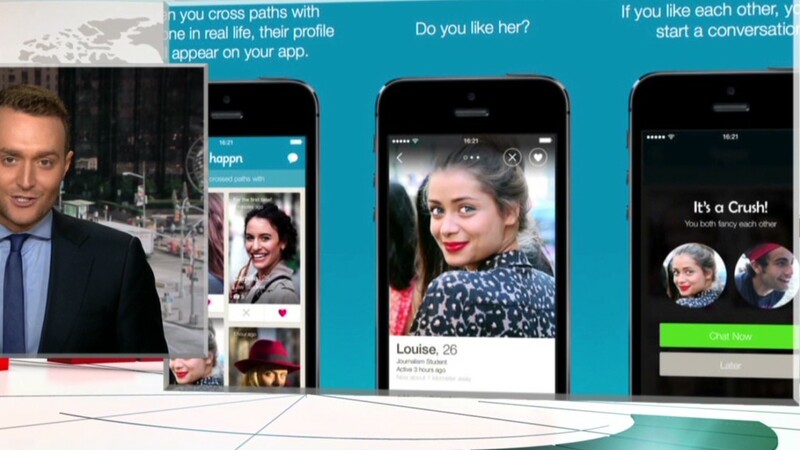 But unlike Happn, it doesn't keep a log of all the latest people you've crossed paths with. Many traditional dating websites are struggling to keep up with location-based apps like Happn and Tinder. Spark Networks (LOV), which owns sites like ChristianMingle.com and Jewish dating website Jdate.com, has seen its revenue and subscriber base decline as users move from websites to apps. That company's stock is down 40% over the past year.